The spur dike at Wiley Slough on Fir Island, Washington provides a trail deep into the wetlands of the Skagit River Delta. The first time I came here, I was blown away by the grandeur of this place. I have returned several times and each time, I have discovered something new. 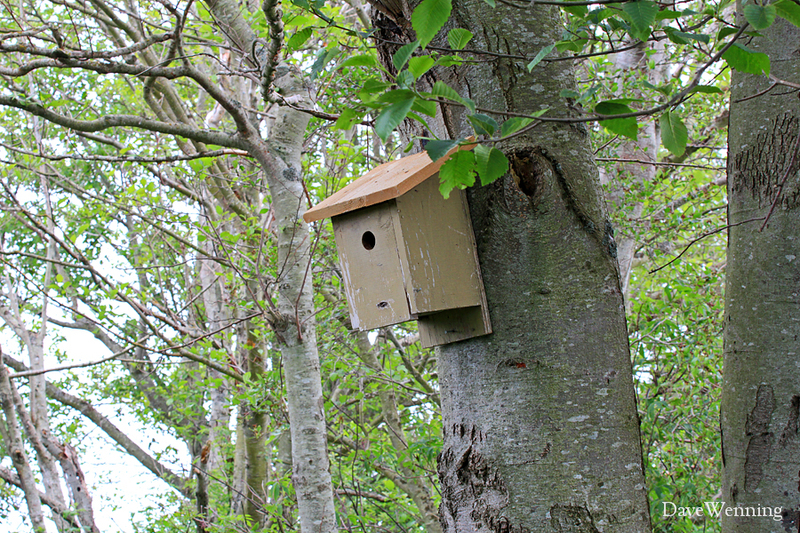 On my first visit, I noticed a couple of nest boxes for birds had been put up on some of the trees. This was most unexpected to find in what otherwise comes close to being a wilderness. 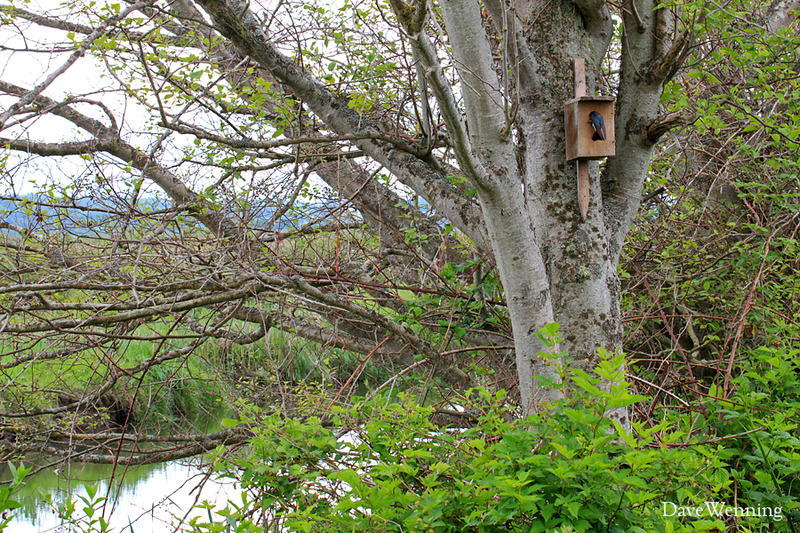 This site is the Skagit State Wildlife Recreation Area. It is managed by the Washington Department of Fish and Wildlife. Activities include public duck hunting, hiking, birding, dog training and botanizing. 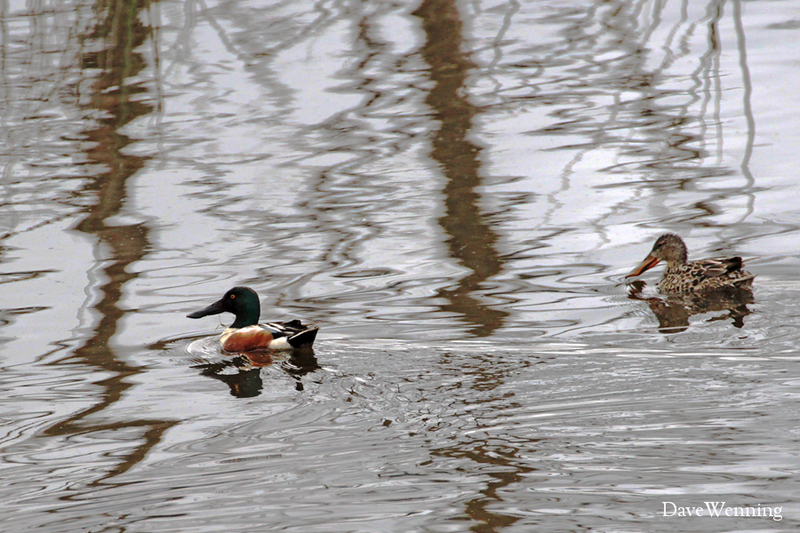 Hunting season is over now so these Northern Shovelers (Anas clypeata) can feel safe raising their young. 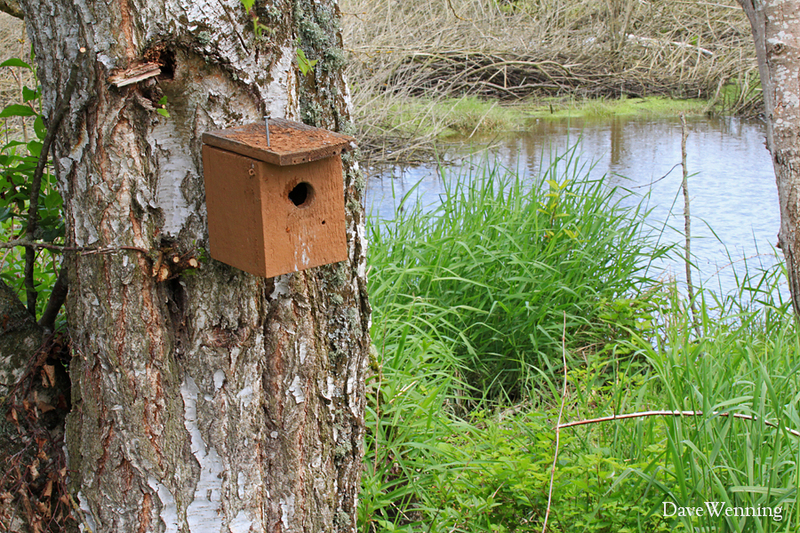 On my most recent visit in late May, I noticed that there were actually several nest boxes along the trail. The dike extends out about a mile and a half (2.4 km) towards Skagit Bay. 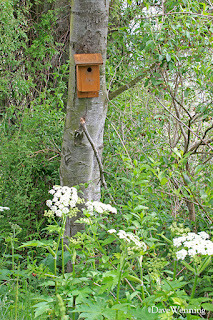 I discovered nest boxes along the entire way. In all, I counted around thirty. 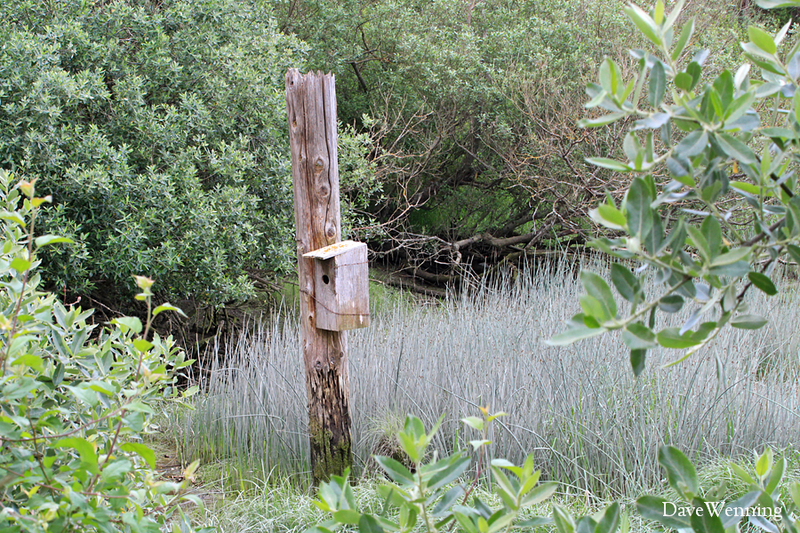 This large box was mounted on a post out in the salt marsh. There is a variety of styles and sizes, but nothing to indicate who put them up. Whether by an individual, an organization or informal group, it was obviously a labor of love. I wish I knew the history behind them. 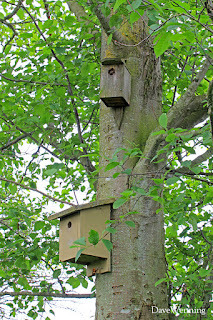 I would appreciate hearing from anyone who knows the story of these nest boxes. 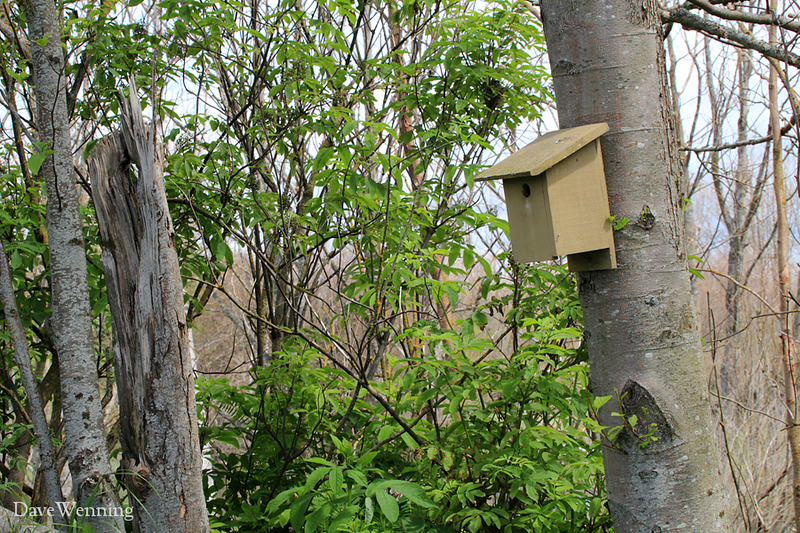 I am a sucker for a mystery and these bird houses definitely qualify as a mystery. Those of us who enjoy visiting wild places learn to notice small things. It is especially rewarding to discover something for the first time. Even with grand scenery and beauty all around, a good skill to develop is learning to pay attention to the details closer in. This is not a jogging trail. This is a place to relax and walk slowly and quietly. 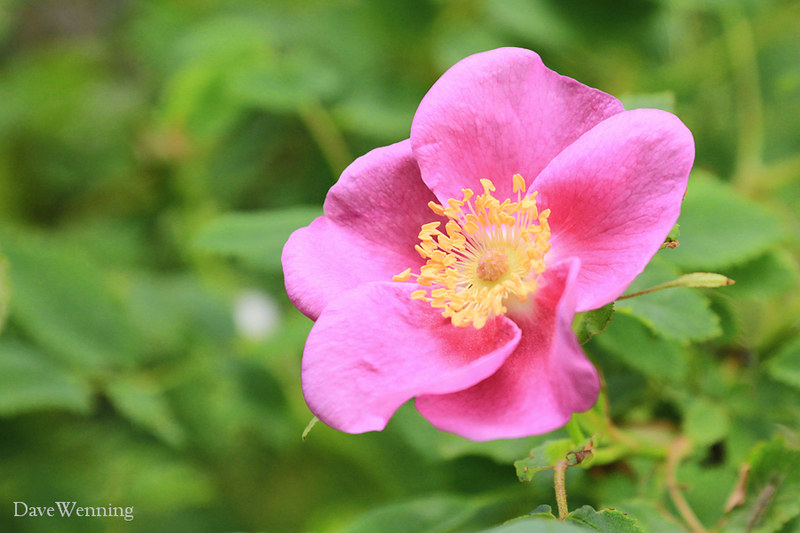 Nootka Roses (Rosa nutkana) are blooming now. The flowers are large, up to 3 inches (8 cm) across. These native shrubs seem to love this wetland habitat. They serve as a host to many insects which, in turn, provide food for birds and small mammals. 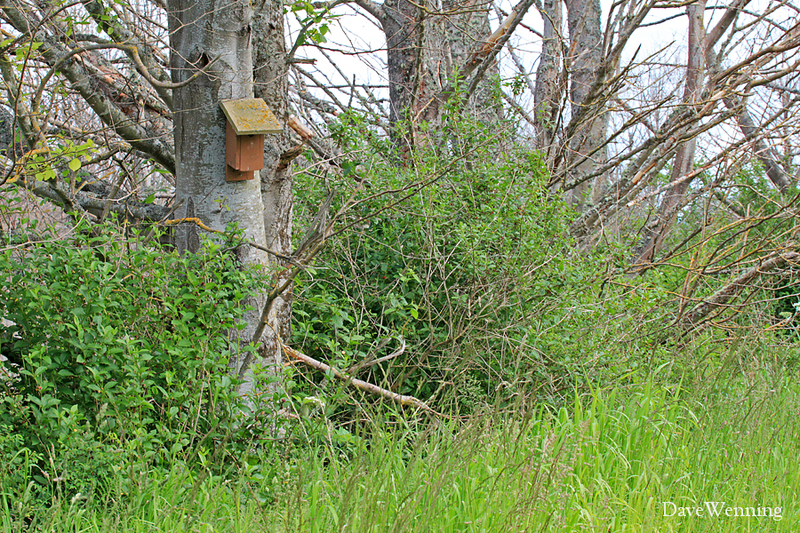 Rose thickets provide favored nesting sites for sparrows and Spotted Towhees. Dense, thorny twigs protect the nests and keep predators at bay. 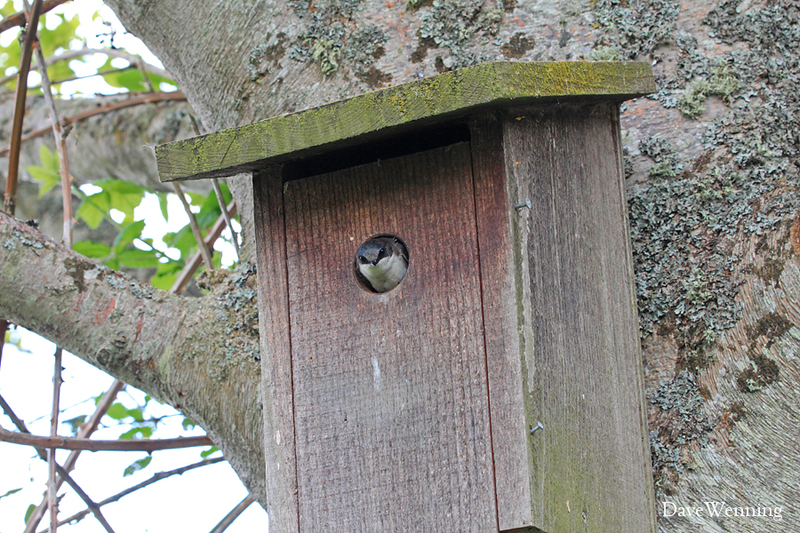 Many of the nest boxes were occupied by Tree Swallows (Tachycineta bicolor). They did not seem to be concerned by my presence and went about their business as if I was not there. They have probably become accustomed to having a few people around. Although never crowded, this is a popular area for nature enthusiasts. 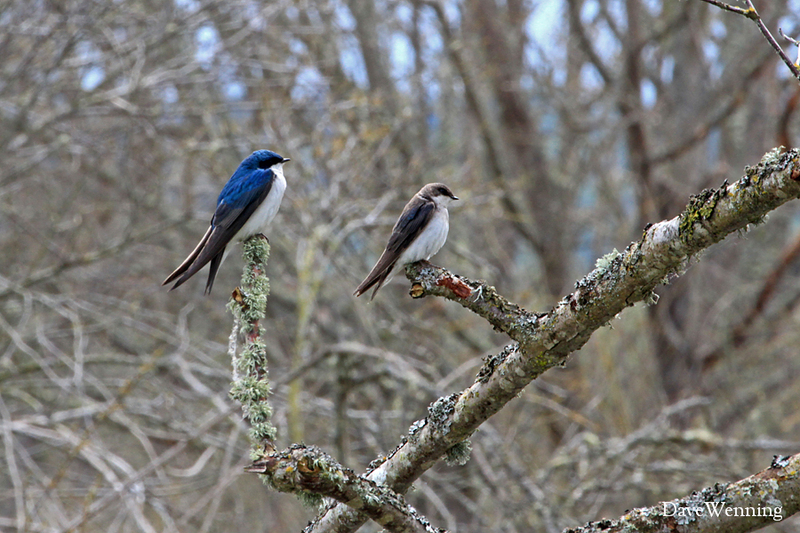 The Tree Swallow's favorite habitat includes open areas near water, fields, marshes, meadows, shorelines, beaver ponds and wooded swamps with standing dead trees according to iBird. 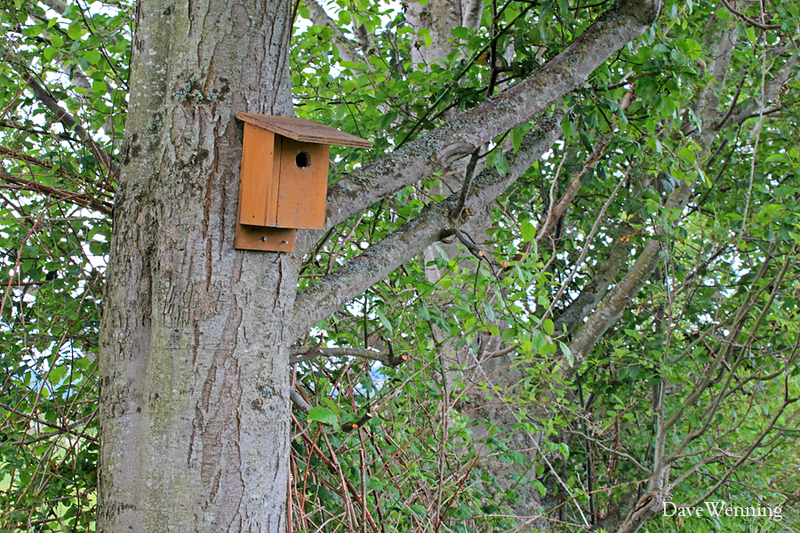 The Wiley Slough "Nest Box Trail" certainly fulfills these criteria. 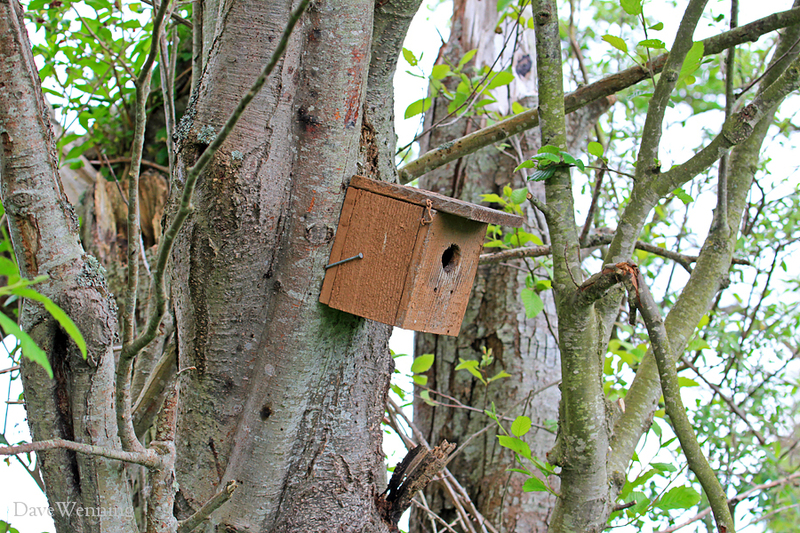 The birds normally build nests in a tree cavity, but a nest box will do nicely. Incidentally, the iBird smartphone apps have been on sale recently, so check the current pricing. "Move along now. There's nothing to see here." 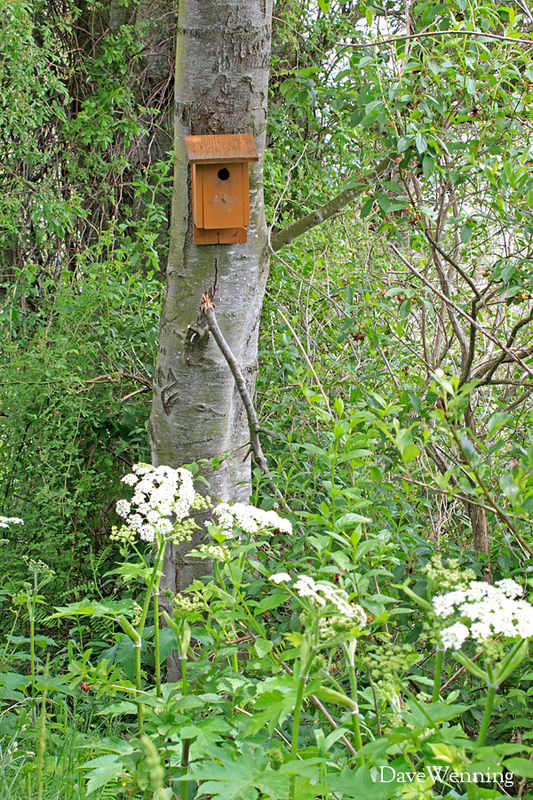 Left: Cow Parsnip (Haracleum lanatum) is blooming below this nest box. This is indeed a Herculean native plant which may grow 10 feet (3 m) tall. The flowers can be a foot across. 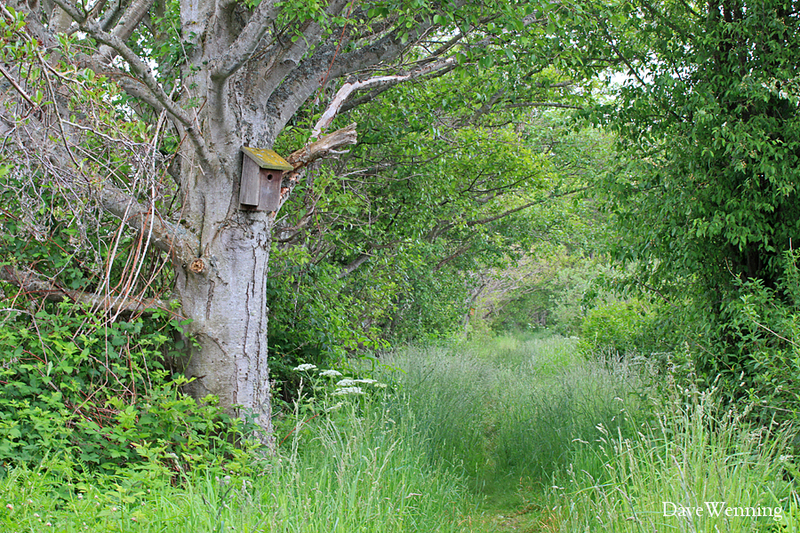 This time of the year, the wetland forest along the dike becomes a Garden of Eden. 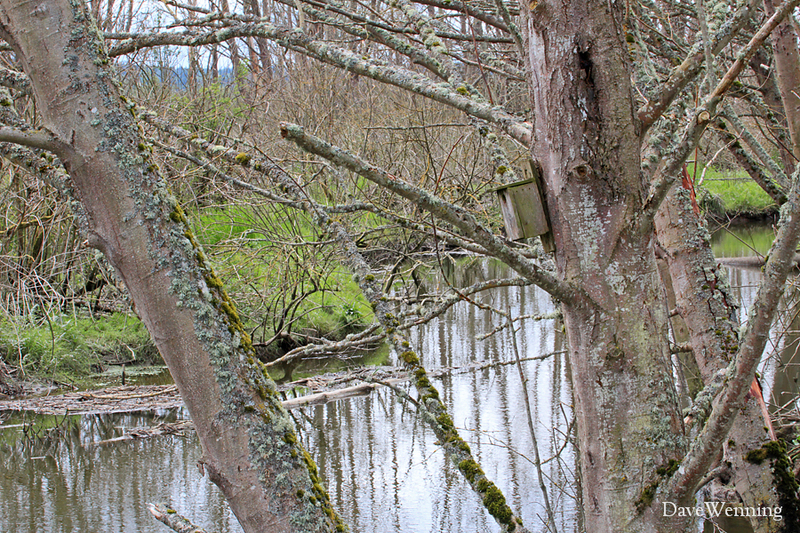 Right: This Red Alder (Alnus rubra) is providing support for two nest boxes. Red Alder, Paper Birch (Betula papyrifera), Pacific Crab Apple (Malus fusca) and various willows are found in this wetland forest. There are also a few Sitka Spruce (Picea sitchensis), a conifer that can apparently tolerate the boggy conditions here. 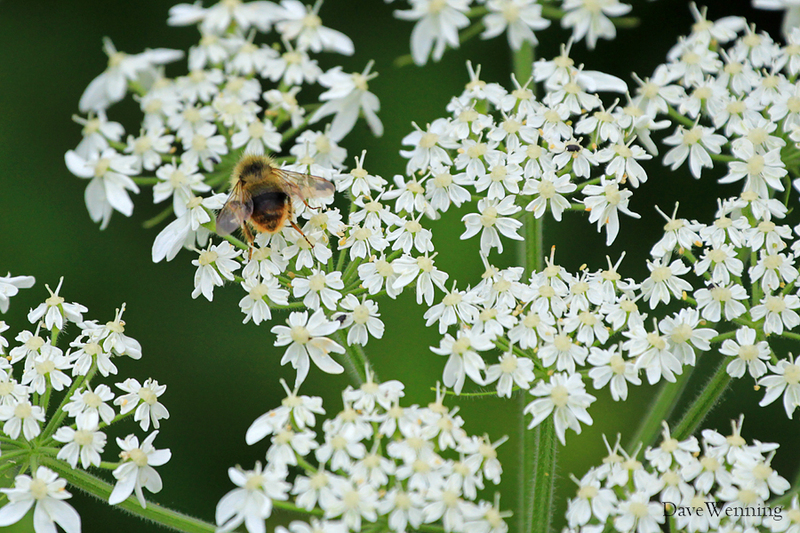 Both this Bumble Bee and I were enjoying the huge Cow Parsnip flowers. I believe this bee is Bombus frigidus said to be common in the Pacific Northwest. Do you agree with the identification? 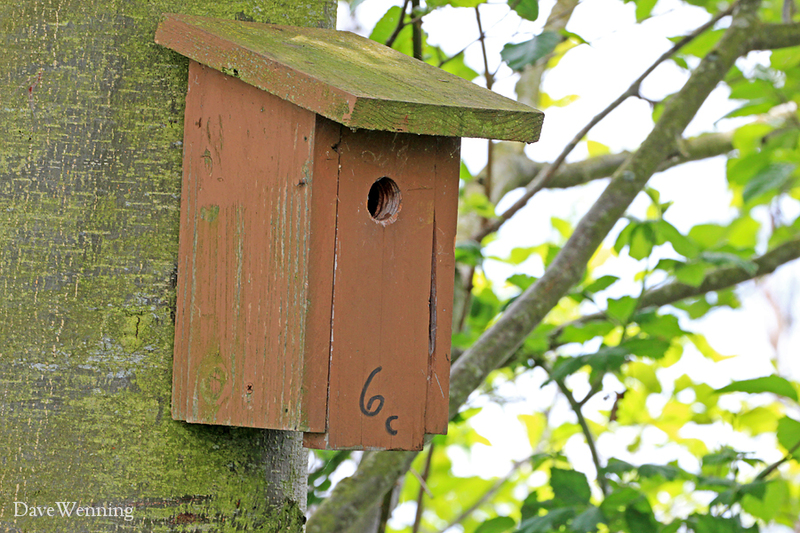 A few of the nest boxes had numbers on them, but I could not detect a system to the numbering. This box is number 45A, but I don't know what that means. Another box was marked 6C. 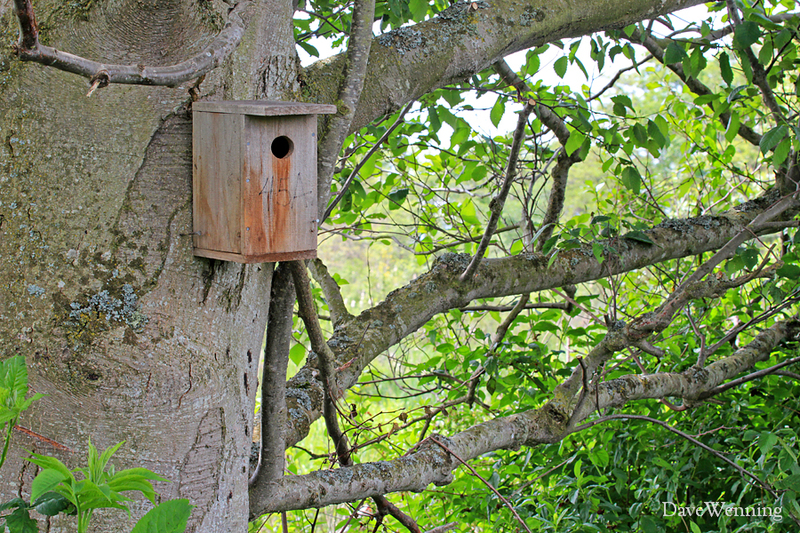 It is another mystery of the "Nest Box Trail." 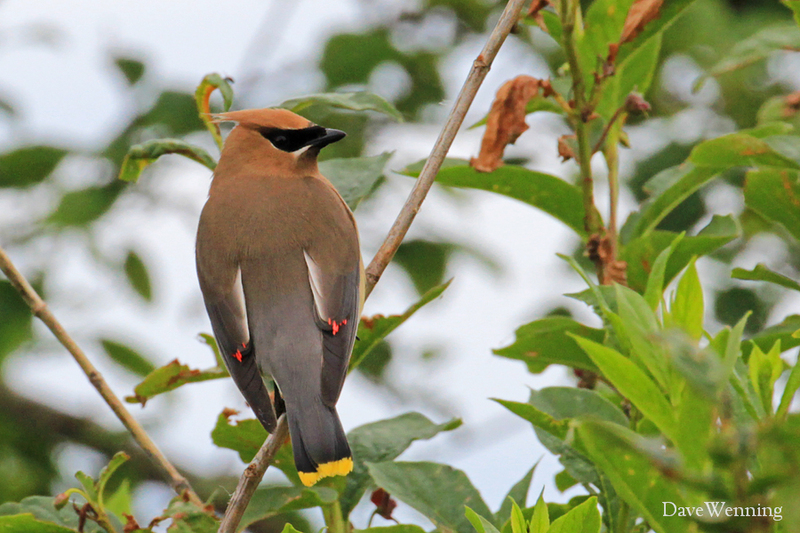 A Cedar Waxwing (Bombycilla cedrorum) paused just long enough for me to catch a photo of his back. The shot reveals the red, waxy spots at the ends of his secondary wings that gives them their name. Their favorite food is fruit, flowers and insects. The Black Twinberry Honeysuckle (Lonicera involucrata) on which he is perched is flowering now, but it will bear fruit within the month. Come fall, there will be mobs of Waxwings here enjoying the fruits of Pacific Crab Apples that grow all along the dike. 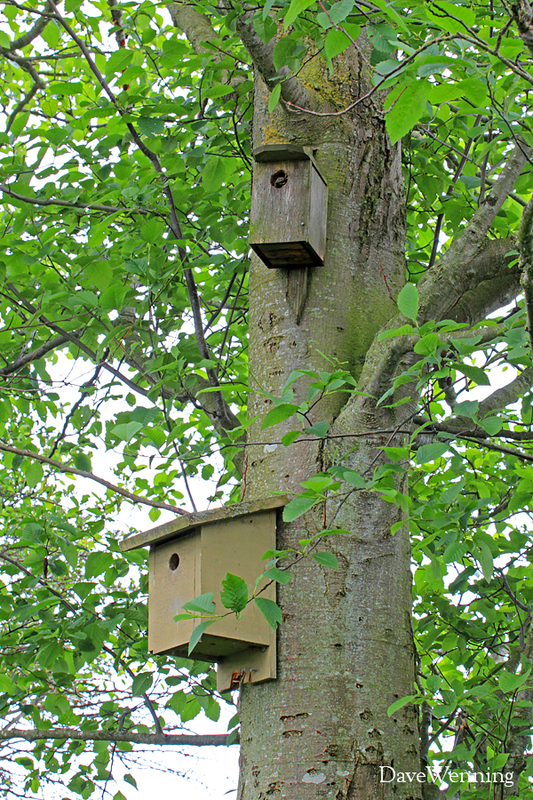 They are also cavity nesters, but I did not spot any using the nest boxes. There is more about this photo at Wild Fidalgo. Wiley Slough has undergone a restoration project, in part, to improve the rearing habitat for young Chinook Salmon. After hatching in fresh water upstream, they must spend time in these brackish intertidal waters. This allows their bodies to become accustomed to salt water before entering the sea. The project opened about 180 acres of wetland to this purpose by removing and relocating dikes. In the background of the photo, Fidalgo Island is visible. The small peak is Mount Erie, the highest point on the island. With few exceptions, posts here will be about Fidalgo Island, or nearby places where Fidalgo can be seen. 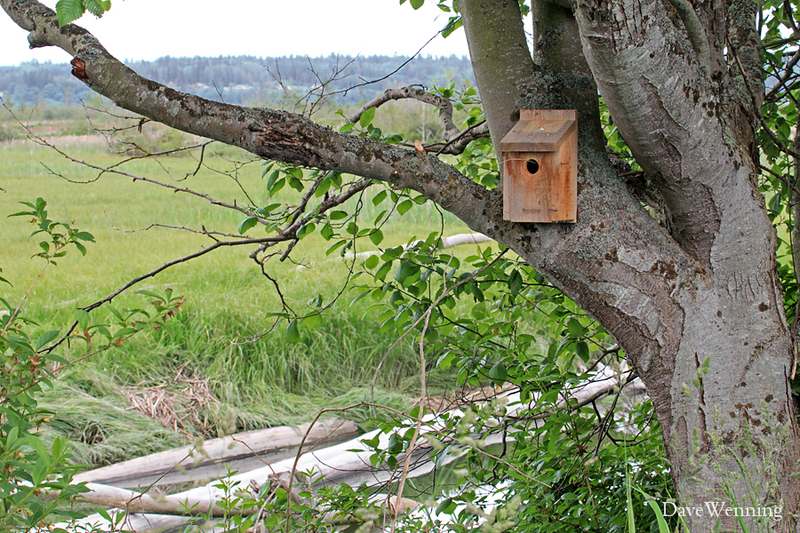 The dike at Wiley Slough provides a unique opportunity for nature lovers. 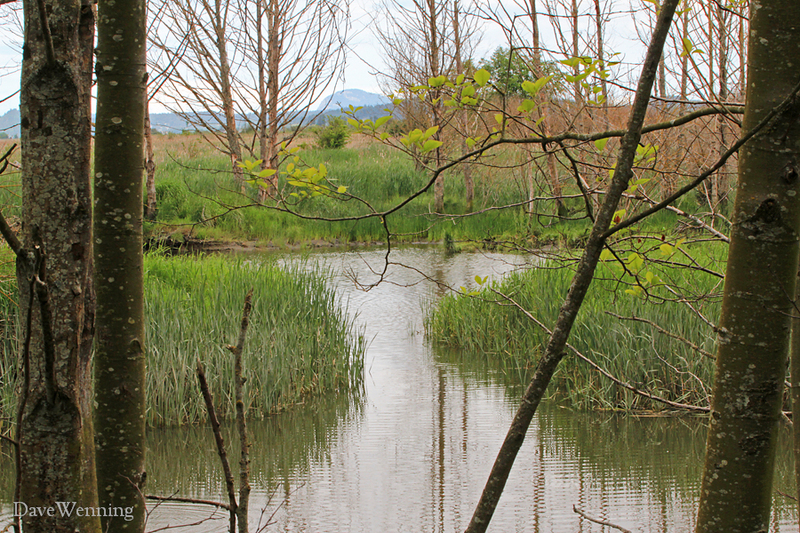 It allows visitors to comfortably walk deep into the wetlands of the Skagit River delta while keeping their feet dry. The dike serves as a trail above the marshes, ponds and sloughs of the wetlands. It is easy to forget that visiting this wilderness is made possible by the engineered structure beneath our feet. 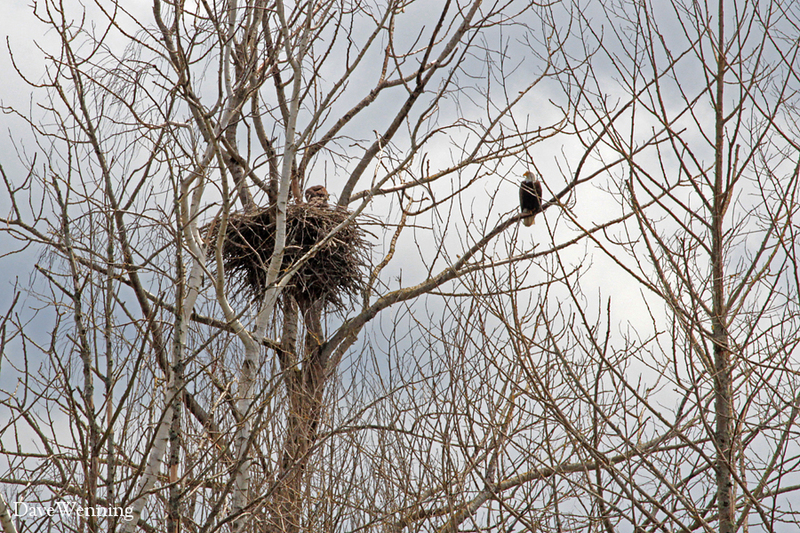 I was pleased to see that the Bald Eagles' nest was occupied again this year and that the "Eagleson Family" was home. Pairs may have more than one nest in their territory. They will change locations if there is too much disturbance at one site. Leaving a nest vacant for a season to clean it of parasites is another theory for nest rotation. At the duck blind, look south across the big pond to spot the nest. You might notice that water is flowing in spots, sometimes downstream and other times upstream. The direction will be determined by the tides in Skagit Bay and by river levels. The visitor will discover how a great river is meant to enter the sea. It divides into myriads of small channels and forms into ponds and tidal marshes. This slows down the flow of water which allows sediments to settle out. Water is cleaned of pollutants by natural processes before entering the sea. This is nature's sewer system. A rich habitat is created in the delta and the sea is protected from the damaging effects of unrestricted river flow. Both people and wildlife benefit and this is why we make an effort to protect places like this. 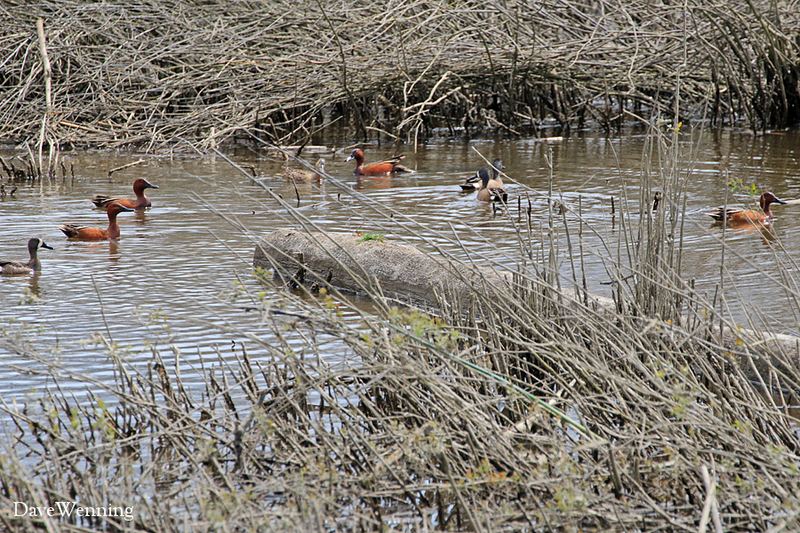 I believe this is a mixed group of Cinnamon Teal (Anas cyanoptera) and Blue-winged Teal (Anas discors). The two are known to interbreed. If I have mis-identified them, please let me know. Despite the fact that this is not hunting season, all the ducks along the dike were quite skittish. It was not possible to get very close. Only photos with a zoom lens were possible. The spur dike at Wiley Slough is one of the best places I know for spotting wildlife, viewing native plants and enjoying some Northwest nature. It is also one of my favorite spots to blog about. 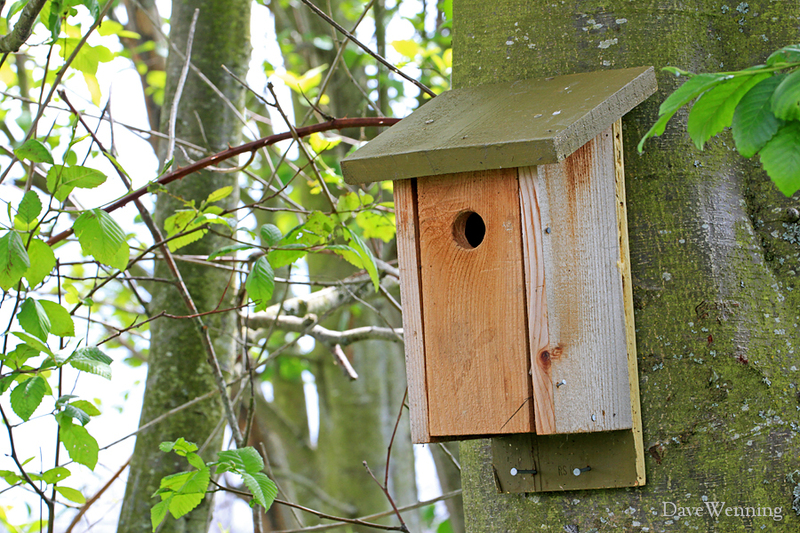 If you get a chance to visit, let the nest boxes be your guide. To find it from Interstate 5, take the Lake McMurray exit 221 and head west. Quickly, make the first right onto Fir Island Road. Continue west and turn left onto Wylie Road. The entrance to the site is at road's end. Look for the Fish and Wildlife sign and don't forget to bring your Washington Discover Pass. Always look forward to your entries. I think this is perhaps, one of your best. Are My Favorite Trees in Trouble Again?